Home ownership brings a lot of pride until you are forced to look at the same interior design year after year. A kitchen tends to be the hub of activity for most homes, and replacing cabinets is a guaranteed way to bring back some excitement. This type of project often carries a shockingly high price tag. An equally effective and less expensive method of updating the kitchen is to refinish the cabinetry. Before a beautiful new look can be applied, the old polyurethane finish has be removed. Refinishing kitchen cabinets can dramatically change the look of the entire kitchen. Remove all doors, drawers, hinges, handles and knobs. Use a screwdriver to remove the screws, twisting in a counterclockwise direction. Use a marker and a small piece of masking tape to label each drawer and cabinet door with a designated symbol that indicates where they go when finished. Save all hardware and screws in a convenient location. Place a drop cloth over the floor in a well-ventilated area you have picked to strip the polyurethane off the cabinets. Set all doors and drawers on the plastic in the order you wish to complete them. 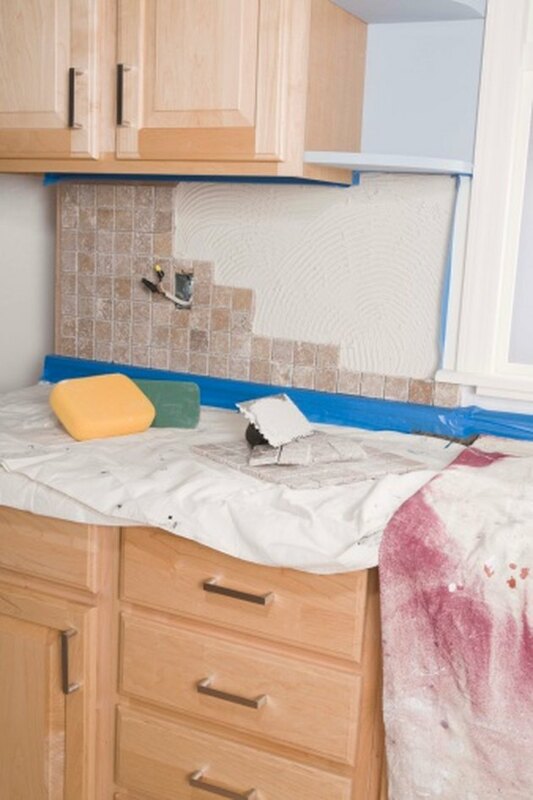 Place a drop cloth over all counters directly beneath the cabinets you will be using the stripping agent on. Secure it in place using masking tape. Put on a face mask and protective gloves. Apply an even, thin layer of gel stripping agent to small areas of the finish on the cabinets using a paint brush. Wait a few minutes for the gel to begin working. The polyurethane finish will start to bubble up. Hold the putty knife down toward the wood surface at a 45-degree angle. Begin carefully scraping the polyurethane and stripper from the wood. Scrape with the grain of the wood to avoid gouges. Dip a steel wool pad and toothbrush in stripper to finish scrubbing away areas of polyurethane that seem to not want to budge. Allow the surface a few hours to dry. Use a small belt or palm sander with 220-grit sandpaper to smooth the surface and remove all leftover stripper. Wipe the surface with a damp cotton cloth to remove any remaining dust.